A great research on the British Animation Company, Cosgrove Hall! 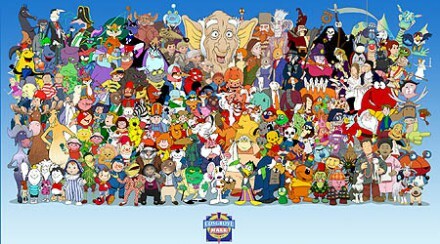 I don’t know if it’s because I grew up with them but as far as I’m concerned the 80s and early 90s will always be the best era for children’s television, especially with British animation. Shows like Superted and The Trap Door, even the ones for younger kids like Postman Pat, I could still happily watch today. Review on the Velveteen Rabbit narrated by Meryl Streep! 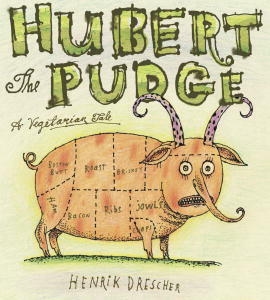 Vegbooks’ review on Hubert the Pudge! This book by Henrik Drescher doesn’t beat around the bush. It’s the story of a horrible pudge processing farm where the animals are kept confined until it’s time for slaughter. Happily, one small pudge named Hubert escapes on the rare occasion that Farmer Jake lets the animals outside while he cleans the barn. Hubert grows large in the jungle then returns to free his friends and strong-arm Jake into doing something better with his life. In the end, Jake cleans up his act, finds love, and opens a tofu hot dog company. 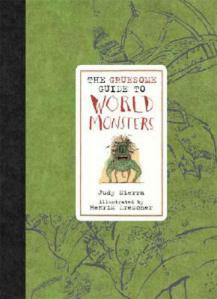 Annotation: Monsters from different folklore are explained. Personal Reaction: I loved this book! I do enjoy a good scary monster tale. Little kids might actually get scared, however, because some of these monsters are reputed to be quite deadly. The monsters are all ranked on a skull and crossbones scale, five skull and crossbones being the deadliest. I thought that was a cute touch. There is a forward that explains that all these monsters come from actual folk stories from countries all over the world. I would recommend this book for very brave children! This book encourages print motivation with its very colorful (often bloody) pictures. A fantastic review on the Fool and the Flying Ship!